This maple orange roasted eggplant is sweet, a bit crunchy on the outside and way better than the normal eggplant mush. To sum up my feelings on eggplant, I’d best describe it as an abusive relationship. I keep giving it a second chance (it’s had about 30 years of second chances) only to be beaten down with it’s mushy texture and blah taste yet again. Thankfully, this pathetic pushover part of me seems to only express itself with food and not real life. But, if I wasn’t a pushover, I wouldn’t have discovered this. 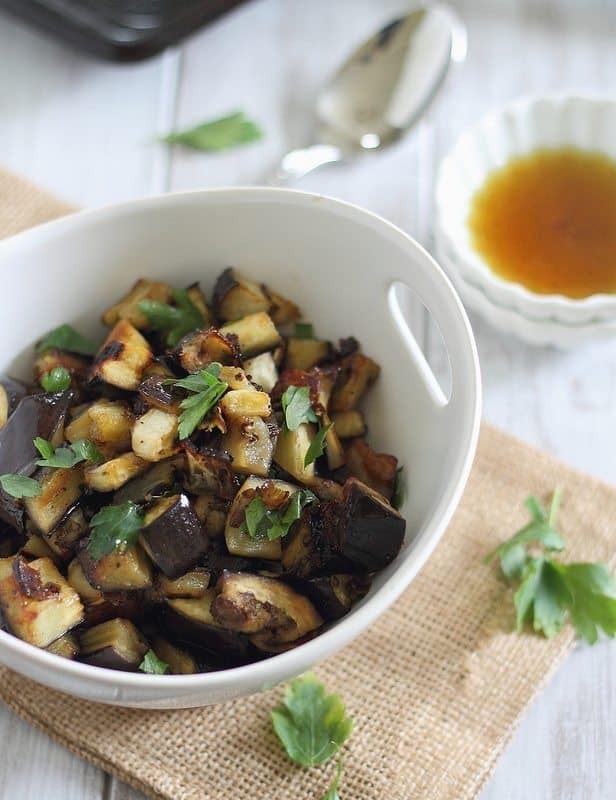 Sweet maple, tangy orange, caramelized little crunchy cubes of eggplant. 1. cutting it small enough so that it gets crispy and there’s not too much of the spongy mush factor in each piece. 2. dousing it with something so delicious you’re tempted to drink the dressing. I consider this recipe the start of seeing a really good therapist. The relationship is not out of the woods, but we’re getting there. Combine olive oil, maple syrup, orange juice, coriander and salt & pepper in a small bowl and whisk together. 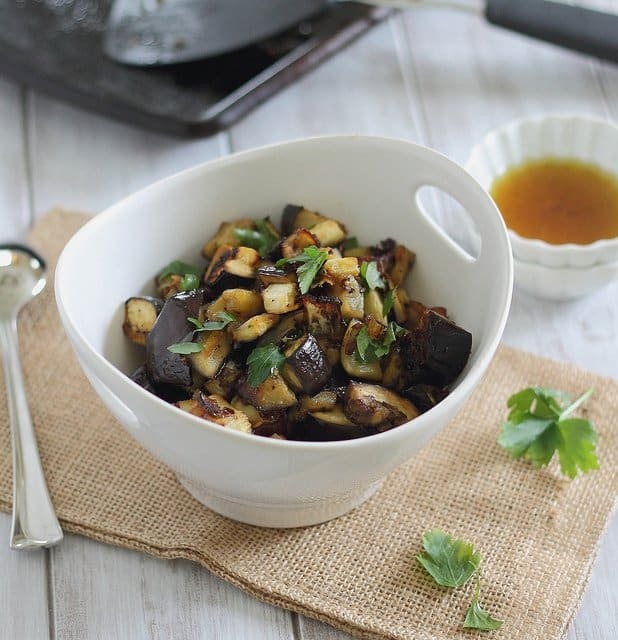 Place chopped eggplant in a large bowl and pour all but 1 tablespoon of the dressing on top. Mix until each piece is well coated and spread out onto baking pan in a single even layer. Sprinkle with some more salt & pepper to taste and roast for 25 minutes flipping once half way through. Remove from oven, transfer to a serving bowl and drizzle remaining dressing on top. I don’ know? Your dish looks very good, but I’m not an eggplant fan, as much as I have tried it. But if it gets a little crispy and the texture changes, I may like it? If an eggplant makes it into my life, I am going to try your recipe!! I definitely wouldn’t think to mix some fruit with eggplant… and I LOVE eggplant! I’ll definitely have to give this a try. I love eggplant… I think it’s an acquired taste though! Love the idea of adding orange to this. It makes me think of Chinese food. This looks so delicious! I’m back and forth on loving or hating eggplant, because sometimes it is way too mushy (especially in leftover form) with an oddly rubbery skin (definitely in leftover form). I end up making it the same two ways, so I’m excited to try your version! I am one of those people who loves eggplant, and this sounds seriously delicious. I may have to make this soon! 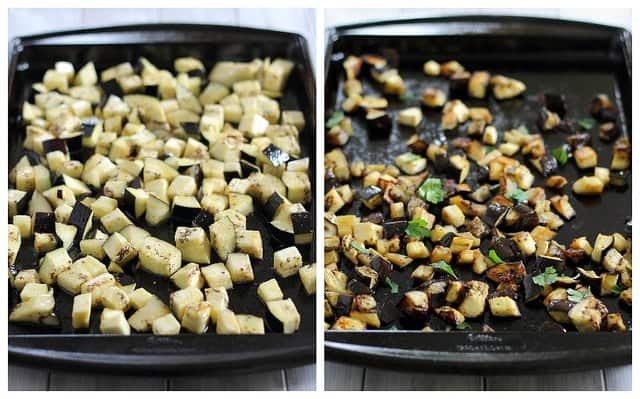 I’m definitely all about crispy eggplant! The only other dish I’ve ever loved it in, is Moussaka – definitely should give that a try if you’re into that type of eggplant! i am not much of a eggplant person but i always come home with some. I have one sitting on my fridge needing some desperate use and your recipe sounds so delicious. I am on my way to make these. thanks for sharing. That mushy, sponge like texture is precisely the reason I’ve only partaken? Partook? Whatever, eaten eggplant. It might be worth another go if I can keep it crispy like this. 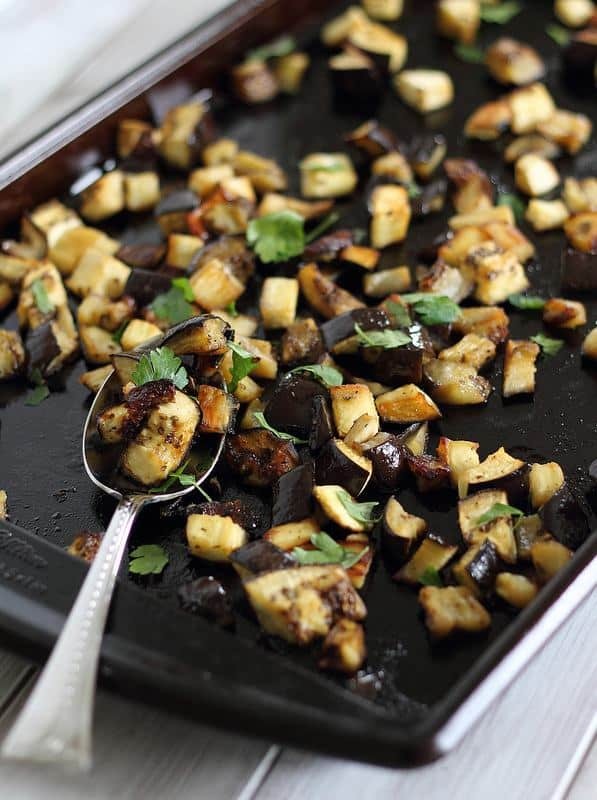 Can’t go wrong with roasted eggplant…especially if you were able to get it crispy! This looks incredible. This looks so delicious! I actually love eggplant but this takes it over the top! I actually am a big fan of eggplant and eat it on the reg. I made this recipe but swapped the maple syrup for balsamic vinegar and then tossed it with chopped cucumber and avocado when it was done baking. Yum! Wow this is perfect for me! Only 30 minutes to prepare and cook. But instead of baking, can I fry it? Would it taste different? I’ve never seen eggplant prepared this way before, and it looks delicious! I’m with you- eggplant can either be really good or really bad, depending on how it’s prepared. I’m excited to try this recipe! Maple and orange is one of my favourite combos for marinating meat, but I would have never thought to combine this with eggplant. Delicious!